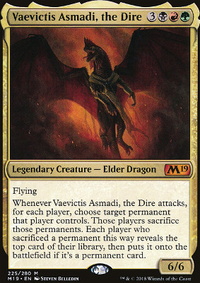 Each player plays with the top card of his or her library revealed. 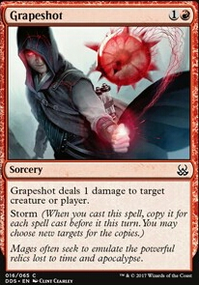 Tap, Sacrifice Lantern of Insight: Target player shuffles his or her library. Consuming Aberration is easier to deal with in comparison with Paradox Engine , Engine also allows you to stack triggers to untap all your rocks a multitude of times. As long you can cast your spells, you can go pseudo-infinite. 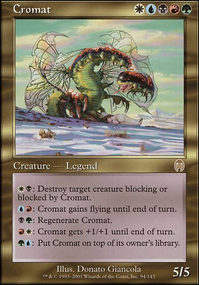 If you are already going infinite mana than Aberration is a waste of a slot as you can recast your commander. 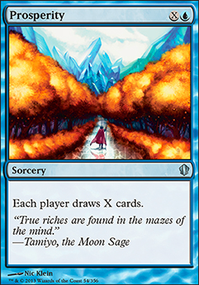 Paradox is just good in general and also allows you to control their deck far more efficiently when it's resolved. Take this scenario where you have Lantern of Insight on the field along with Circu, Future Sight , Sensei's Divining Top as well as Ghoulcaller's Bell . 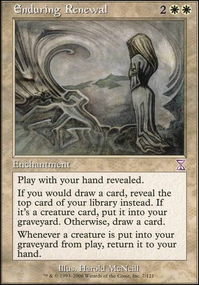 With Paradox on the field and mana rocks that produce at least 3 mana, you can essentially control the draw of everyones board state locking down the board, you see what they draw, if you don't like the card cast a spell to trigger Circu by using the mana provided by the rocks, on the stack you can either mill the card or target other players before untapping all your nonland permanents. You can play with Lantern of Insight if you think that's a good idea. Wand of Denial lets you get some choice out of what you get. Your deck looks pretty fun. +1. Memory Plunder would be great tech for mill strategies, same as Lantern of Insight so you can see who to mill as well. Altar of the Brood is also quite funny for the consistent mill. Codex Shredder is a great tool as well as recursion engine when you want something back from your grave. First off, You might like Lantern of Insight . Great way to know who exactly to hit. Second, you might love Decaying Soil (with threshold) + Deathrender . ETBs For as much as you have mana. Obviously much better with infinite mana, as then you can just exile everything and win with Gonti. You might like Lantern of Insight as a way to see what your getting, know of of it’s worth it to attack/who you should attack with just one creature, and a shuffle effect when you can’t use any of the top cards. 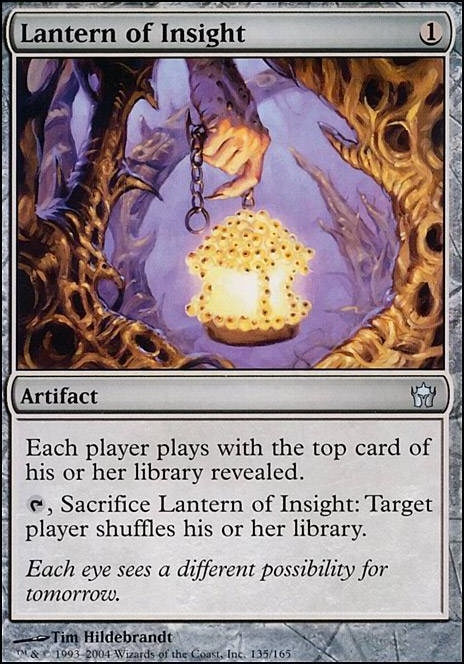 Lantern of Insight could do some work as a pseudo control card to prevent opponents from drawing specific cards. 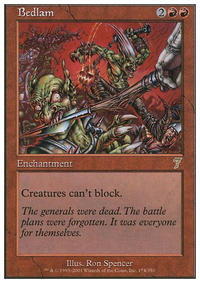 Some general tribal cards like Patriarch's Bidding and Descendants' Path might be worth a look. If you find yourself paying the 1 then Thousand-Year Elixir might be worth a look but I don't think it's necessary at all. Neat deck! 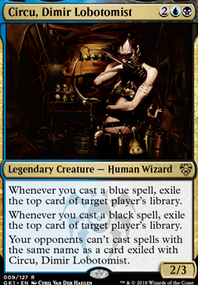 I think you want to have all 4 Cosi's Trickster, as it's one of your best payoffs. Same thing with Lantern of Insight, it's one of the better shuffle effects just because it's only 1 mana. If you play some Field of Ruin and/or Ghost Quarter in your lands, you can have a way to force your opponent to shuffle their library while having some maindeck tron/manland hate.